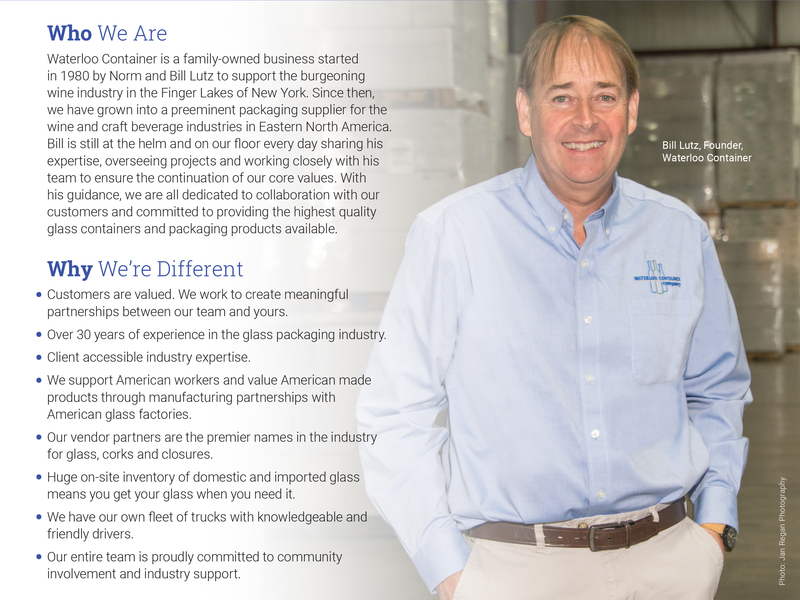 Waterloo Container is a family-owned business started in 1980 to support the burgeoning wine industry in the Finger Lakes of New York and on the East Coast. Since then we have grown with our customers into a preeminent packaging supplier for Eastern North America. We take pride in being a one-stop shop for the highest quality glass containers and packaging products available. By constantly updating our inventory, trying new styles and introducing new colors and services, we are always looking to have what you need when you need it. What started out as a small distribution of glass bottles to support a new branch of the wine industry has grown into a much larger operation stocking bottles, corks, capsules, wax and boxes. Our growth stems from our customers’ growth and their feedback allows us to tap into industry trends and continuously improve our offerings.